Supposedly a claw of the mythical griffin, half- eagle, half-lion, who speaks in German on the lip: ‘A griffin’s claw I am called, in Asia, Arabia I am well known’. The cup is made from a buffalo horn, set on a claw to resemble the griffin’s talon. This one was made for the von Greiffenclau family who took their name and arms from the griffin. Standing cup and cover; cow's horn mounted in silver-gilt; embossed and chased; mouth with broad band with Lot and his daughters in relief and Marcus Curtius leaping into the chasm; in front is shield of arms with griffin supporters; point with mount engraved with floral scrolls, surmounted by eagle; middle band chased to represent fur and joined to base by bird's claw; circular base with embossed animals surrounded by engraved border; cover chased in relief with border of busts, masks and terminal figures; knob in form of eagle displayed supporting two shields; inscribed. Origin: Mainz, mid-16th century; mark of Lorenz or Hans Faust (both first recorded as goldsmiths in the tax returns of 1541 - Lorenz died between 1558 and 1568 and Hans died before 1583). (i) Assay mark for Mainz: a wheel within a plain shield punch, being; the earliest recorded form of this mark and known to have been in use in the sixteenth century (R33324; Scheffler no. 727). (ii) Crossed barbed hooks within a plain shield-shaped punch, being the maker's mark of either Lorenz (or Hans) Faust (R33337; Scheffler no. 788). Provenance: Baron Anselm von Rothschild, Vienna, before 1866 (cat no. 213), by inheritance to his son Baron Ferdinand Rothschild (d. 1898). Commentary: Although the exact date when Baron Anselm von Rothschild acquired this griffin's claw cup is not known, it is surely more than a coincidence that in 1860, with the death of the last of the male line of the ancient Mainz noble family of von Greiffenclau, the traditions of a 500-year-old era at the Schloss Vollrads, in the Rheingau, had come to an end. The distinctive coat of arms on the front of the rim-mount, immediately beneath the inscription, belongs to this noble family of von Greiffenclau, which since the beginning of the fourteenth century had chosen to use this surname in preference to that of the founder of their line, the knight Volradus von Winkel, who soon after 1218 established the family at the Schloss Vollrads, just north of Ortes. Four hundred years later, the head of the House of von Greiffenclau was to become ruler of the principality of Mainz and the funerary monuments to this Kurfürst Georg Friedrich von Greiffenclau zu Vollrads, Archbishop of Mainz 1626-9, can still be seen in the Chapel of St Michael, with its ‘Greiffenklau-Altar’, in the Cathedral of Mainz (see F. V. Arens, ‘Die Inschriften der Stadt Mainz von Frühmittelalterlicher Zeit bis 1650’, Stuttgart, 1958, pp. 317-20, with illus.). The Latin inscription, engraved on the black marble beneath the large coat of arms of Mainz and Worms with (in escutcheon) the shield bearing the von Greiffenclau arms, refers to him as: “. . . NOBILI EQUESTRIS RHENANAE PROSAPIA/GREIFFENCLAW A VOLRATS/QUI A° 1573 NATVS . . .”. There were other powerful public figures among the many generations of the von Greiffenclau family, such as Richard who became Archbishop of Trier between 1511 and 1531 and, much later, two who became bishops of Würzburg - Johann Philipp (1699-1719) and Karl Philipp Heinrich (1749-54). After such an illustrious history, it was sad that the family, which had been ennobled to the rank of Freiherr (Baron) in 1664, should have died out in 1860 and been replaced by another line - albeit linked by a marriage of 1846 - the Counts von Matuschka-Greiffenclau. At the time when this griffin's claw cup was commissioned from the Faust workshop of Mainz goldsmiths, the head of the von Greiffenclau family at the Schloss Vollrads was probably Richard von Greiffenclau, who in 1542 had married Anna von Schonenberg and who died in 1558. Although neither the incised date '1550' (on the rim-mount), nor the pair of shields with engraved coats of arms (on the cover) can be relied upon, since they are later additions, on grounds of style the silver-gilt mounts of this covered cup belong to the end of the second quarter of the sixteenth century and are unlikely to have been made in a prosperous and politically important centre like Mainz after the middle decade of the sixteenth century. It is, therefore, significant that the pair of later shields (on the cover) are, nevertheless, engraved with the arms of the family von Greiffenclau (on the dexter shield) and the arms of the family von Schonenberg (three crosses) on the other shield. If, as has been suggested above (see Condition), the original pair of shields (held by the griffin on the cover) were decorated with the same arms but executed in enamelled colours, then it is very probable that they became so badly damaged that the enamelled plates had to be detached from the original shields and replaced by engraved copies, which were then soldered on (diagonally) to the blank original shields. It is possible, therefore, that the engraved coats of arms are faithful repetitions of the originals and that the cover originally bore the arms of both Richard von Greiffenclau and his wife, Anna. It is interesting to note that among the three subsidiary coats of arms depicted on the 1629 funerary monument of the Kurfürst Georg Friedrich von Greiffenclau zu Vollrads in Mainz Cathedral is the shield bearing the three crosses of the Schonenberg family. The choice of the Faust workshop in Mainz for this commission was probably to be expected, because not only had it been long established, certainly dating back to early in the second half of the fifteenth century, but Lorenz Faust had been goldsmith to that great patron, the rich and powerful Cardinal Albrecht von Brandenburg, who since 1514 had been Archbishop and Kurfürst of Mainz and died at Aschaffenburg in 1545. Lorenz Faust appears in the records between 1545 and 1566 as the holder of various offices (Probiermeister, Stadtwardein and Generalwardein des Kurfürstenkreises) and as assisting the Master of the Mint. Hans Faust, on the other hand, is a shadowy figure for, although he is also listed as a goldsmith in 1541 and is known to have married the granddaughter of the Frankfurt goldsmith Hans Gemminger, his skill as a craftsman remains ill-documented. Between 1566 and 1576 Hans Faust served as a Councillor (Ratsherr) but before 1583 he had died. Regrettably, no other piece bearing the Faust maker's mark has survived. Because of the vigorous quality of the griffin's claw cup and the mid-sixteenth-century character of its embossed and chased mounts, it seems more probable that Lorenz Faust is the creator of this historic piece. 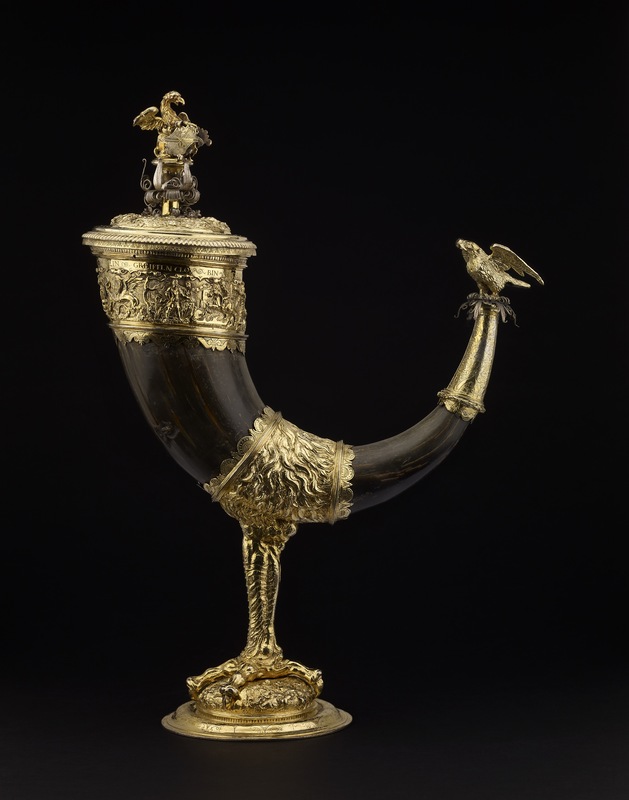 The goldsmith has produced a griffin's claw standing-cup with a powerful new Renaissance character whilst at the same time retaining the traditional medieval form -a drinking-horn set in silver-gilt mounts. The late medieval examples were often referred to as Greiffenklauen because, in popular imagination, the colossal mythical griffin or gryphon had the hind parts of a lion and the foreparts of an eagle, and so large horns were frequently preserved as the talons or claws of this legendary beast. Indeed, it was claimed that their rarity was inevitable because only a saint or a very holy man could obtain one in exchange for curing the griffin of some wound or sickness. Not surprisingly, therefore, the treasures at the shrine of St Cuthbert at Durham, for example, included two griffin's claws, according to a list drawn up in 1383 by Richard de Segbrok (see Liber de Reliquis, 1381, ed. Canon Fowler, in ‘Durham Account Rolls’, Surtees Society, vol. 100, 1899, pp. 425-39); after the Dissolution of the Monasteries in 1542-3, one of these two 'claws' appears to have been saved by Sir Robert Cotton (died 1631) and, with his library, came into the British Museum in 1753 (inv. no. OA. 24; see J. Cherry, in ‘Fake? The Art of Deception’, exh. cat., British Museum, 1990, no. 70, p. 85, with illus.). Unfortunately, its medieval mounts had already disappeared by the time it came into Sir Robert Cotton's possession, but the Latin inscription on the replacement mount records that it is 'the claw of a gryphon sacred to the blessed Cuthbert of Durham'. In France, on the other hand, the Abbey Church of Saint-Denis (outside Paris) was more fortunate because in its famous treasury it had a 'griffin's claw', the medieval mounts of which were not made of gold or silver but merely of gilded copper. The engraved decoration on the mounts can be dated, on stylistic grounds, to the first half of the thirteenth century and, significantly, the stem and foot are fashioned in a crude, simple way to resemble the leg and claws of a griffin - a primitive version of Faust's solution - while at the tapering end an eagle stands on a small spherical terminal, also made of gilt-copper. First briefly recorded in the inventory of 1505, it was described more fully in the 1634 inventory (no. 26), and during the Revolution it was seized but in 1794 was deposited in the Cabinet des Medailles, Bibliotheque Nationale, Paris (see W. M. Conway, The Abbey of Saint-Denis and its Ancient Treasures, ‘Archaeologia’, LXVI (2nd series, XVI), 1915, p. 133 ; also Danielle Caborit-Chopin in ‘Le trésor de Saint-Denis’, exh. cat., Musée du Louvre, Paris, 1991, no. 41). remained a fashionable piece of Renaissance plate, particularly in the Germanic and Baltic lands, and their origins are occasionally recorded because by the middle of the sixteenth century the practice of hallmarking was being successfully introduced in many centres. However, one of the greatest mid-sixteenth-century examples to have survived in situ is the historic Greiffenklaue that was given in 1557 by Mechthild, Gräfin von Tecklenburg to Wilhelm IV, Landgrave of Hesse-Cassel. It is still to be seen in the Kunstkammer at Kassel but, being unmarked, neither its place of origin nor the maker of its beautifully engraved silver-gilt mounts is known (see Eva Link, ‘Die Landgräfliche Kunstkammer, Kassel’, Kassel, 1974, p. 2, with col. pl.). Similarly, uncertainty still surrounds the origin of the strange early Renaissance silver-gilt mounts made for the unique medieval enamelled glass horn of Islamic manufacture (probably Syrian, late thirteenth century), which was in the Kunstkammer of Tsar Peter the Great (1689-1725) and is now preserved in The Hermitage, Leningrad (see J. Kroger, in ‘Europe und der Orient 800-1900’, exh. cat., Martin-Gropius-Bau, Berlin, 1989, p. 575, no. 4/52, col. pl. 211). The many figures on these mounts, which transformed it into a Greiffenklau of exceptional character, are now thought to have a mid-sixteenth-century origin, perhaps in Reval (modern Tallinn, Estonia), while the armorial device is identified with the arms of the Drolshagen family. Curiously, this griffin's two legs (supporting the glass horn at the front) rest on two silver-gilt balls gripped by the talons of the griffin. Perhaps the most comparable of the few surviving early Renaissance examples is the imaginative version in the Hapsburg Schatzkammer by the Augsburg goldsmith Cornelius Gross (master 1534, died 1575). In the same way that the Faust workshop in Mainz paraphrased the medieval Greiffenklaue to produce the family cup of the Schloss Vollrads, so Cornelius Gross has reinterpreted the gothic drinking-horn. He has created a highly original, grotesque dragon with outspread wings and yet, almost playfully, he has depicted a diminutive Renaissance triton or merman having a ride on its back; below, he has introduced into the base another popular Renaissance image, the giant turtle or tortoise. However, the dragon's legs have, most significantly, retained the form of those of an eagle and its vicious talons appear to grip the domed shell of the turtle with the same realism - and undercutting - that Lorenz Faust achieved on the Mainz griffin's claw cup. The Augsburg version, which is first recorded in the 1596 Inventory of the Kunstkammer of the Archduke Ferdinand II of Tyrol at the Schloss Ambras, near Innsbruck, is decorated with a coat of arms, which has been identified as the arms of Graf Montfort-Werdenberg (see R. Bauer, in ‘Führe durch die Sammlungen, Kunsthistorisches Museum’,Vienna, 1988, p. 195, col. pl., inv. no. 889, H. 30 cm, L. 34 cm; see also H. Seling, ‘Die Kunst de Augsburger Goldschmiede 1529-1868’ 3 vols., Munich, 1980, p. 249, fig. 151; E. Kris, ‘Golschmeidearbeiten des Mittelalters, der Renaissance und des Barock. I Teil: Arbeiten in Gold und Silber’, Publikationen aus den Kunsthistorischen Summlungen in Wien, Band 5, Vienna, 1932, p. 39, no. 59, pl. 9. One conspicuous technical difference between the late medieval drinking-horns and some that have survived from the mid-sixteenth century is the method of mounting. Whereas the medieval examples have several strap-mounts running longitudinally from the tapering end-mount to the broad rim-mount, some Renaissance examples - but not the Kassel or Leningrad specimens - have the horn set in a 'sleeve' that encircles the middle of the horn, holding it in an elevated position above the ground - as if balanced on a stem. The Gothic mounts - however sculptural and accomplished - had been designed to keep the horn upright, while still allowing the horn to rest on the ground (or table) - or, at most, raising it only very slightly above the surface. A transitional stage is magnificently represented by the famous Polish royal horn of the reign of Sigismund I (1506-48) and his Italian queen, Bona Sforza, which is dated 1534 and is preserved in Cracow's National Museum (see Kohlhaussen 1968, pp. 482-3, no. 472, figs 686-7, where the finely engraved silver-gilt mounts are attributed to a Nuremberg workshop influenced by the engraved designs of Heinrich Aldegraver, even though he was at that time only a young artist in his early thirties). The horn rests in a 'sleeve' that is supported on the back of the crouching figure of a man kneeling on a rocky, oval, domed base, thus raising it quite dramatically above the ground. There are no longitudinal strap-mounts - only a very broad rim-mount and a conical tapering mount at either end of the horn - but the crouching caryatid figure (in contemporary costume) is reminiscent of the late fourteenth-century kneeling figure that supports the historic Greiffenklaue in the Saxon Electoral Kunstkammer in Dresden (see Kohlhaussen 1968, p. 140, no. 232, figs 246-9; also ‘The Splendor of Dresden’ 1978, p. 78, no. 20, with col. pl.). Within a few decades of the 1534 horn's being made, the workshops of Lorenz and Hans Faust in Mainz and of Cornelius Gross in Augsburg were among those in Germany whose works completed this process. In effect, they transformed the late medieval ceremonial drinking-horn into a 'curiosity', set cunningly within the overall design of a handsome standing-cup and worthy of display within a Renaissance Kunslkammer. Dora Thornton, 'A Rothschild Renaissance: Treasures from the Waddesdon Bequest', British Museum, London, 2015, pp.256-259.Supposedly made from a griffin's claw for the Mainz noble family called von Greiffenclau, as identified in the arms. Compare a similar cup in Ambras.